With the 2015 Roadmaster, Indian goes all in for luxury touring. Details are in the press release below, but there isn’t much missing from the list of luxury features, including nearly 38 gallons of weatherproof storage, power windscreen, heated seats and grips, tire pressure monitoring, Bluetooth, and “advanced infotainment system” including stereo, phone and Pandora integration. 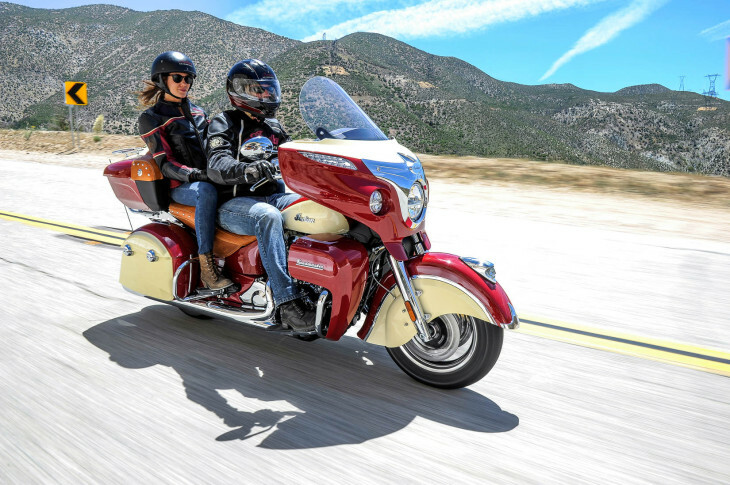 MINNEAPOLIS, Minn. — July 27, 2014 — Indian Motorcycle®, America’s first motorcycle company, is proud to announce the all-new 2015 Indian Roadmaster™, setting a new benchmark as the ultimate in luxury motorcycle touring. Revealed at the annual Indian Motorcycle dealer meeting, this exceptional new addition to the Indian Motorcycle family will make its public debut on August 2 at the 74th annual Sturgis Motorcycle Rally and will be available for demo rides throughout the weeklong event along with the rest of the 2015 Indian Motorcycle lineup. More announcements regarding the 2015 line of Indian bikes will also be made on August 2. Indian Motorcycle’s new flagship luxury touring bike is powered by the awe-inspiring and proven Thunder Stroke 111™ engine, a 49-degree, air-cooled V-twin power plant mated to a 6-speed overdrive transmission. The Roadmaster is dripping in standard chrome, including the forks, trim, trunk rack, front and rear highway bars, fender tips, and many other chrome components that are options on other brands. About twenty years ago, City Bike of San Francisco (PGE pre-Gabe era) threatened or considered never ever again reviewing cruiser bikes, predicting Armegedon soon would befall H-D, that their demographic was dying and not being replaced. Why do people complain that a luxury vehicle isn’t a sport vehicle? It’s not like Indian is making any claims as such. Do you go read Land Rover reviews and complain that they’re heavier than a corvette? Seriously, it makes about as much sense as going to the hardware store and complaining because none of the hammers make good saws. BMW, Lexus, M-B, Audi, and even Chevy Impala SS offer caged vehicles with high luxury and high performance, sometimes among the best handling among all cages. It seems more rare to find luxury and superb handling 2-wheelers (BMW and Kawasaki are exceptions). If I named my kid Babe Ruth, would that guarantee a major league tryout? No, but it tells us all what we need to know about you!!!! Wow the haters are out in force today.I don’t really understand all the complaints about weight on a fully loaded touring rig, they’re all heavy get over it.When you travel long distance you want stuff ,stuff is heavy.This is a good looking fully loaded luxury touring motorcycle.Not an easy task by the way, when you tack maximum storage capacity,navigation,useable stereo,intercom,adjustable this and that and still have it look classy. I like it and if they’re still around when I wear out my “lucky 13” Harley Limited I may buy one.On a side note fully loaded luxury tourers are also excellent “luxury commuters” kinda like driving a Cadillac Fleetwood that gets 35 MPG. Way to go Polaris! In just a few years you have given those of us who chose to be different, a beautiful a Touring Bike! I know I will be able to find where I parked my bike in the Sea of Black Sheep Harley’s ! Long Live Americas First Motorcycle Company! You wanna be different, next te show up at a Harley gathering on a super motard. The Indian Roadmaster is every bit as attractive as the Harley Ultra. However, Harley owners and Harley sockpuppets would never agree. The Roadmaster wins by virtue of being less common and more interesting because it is different. 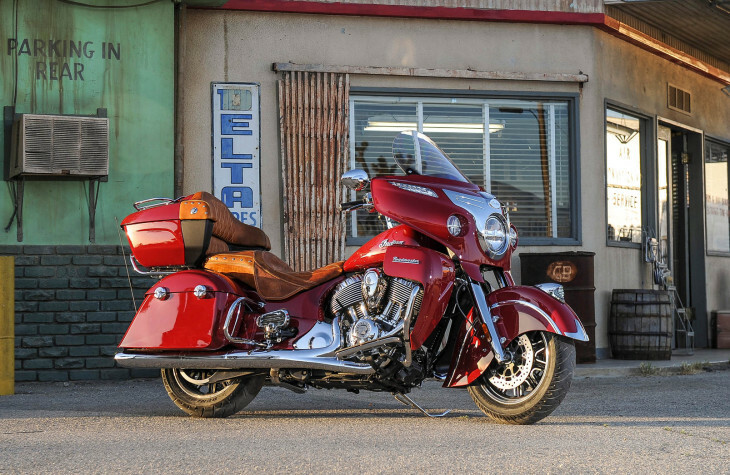 A 1948 Indian Chief Roadmaster today in like-new condition sells for $10,000+ more than the 2015. Advantage=new model. The 1948 had a foot clutch and hand shift. Advantage=new model. The 1948 had leather saddlebags, but way less cubic feet. Advantage= new model. The 1948 weighed about 550 pounds. Way more motorcycle in the new one. A brew pub here in Stockton, California had a black Chief of about 1948 vintage in the bar area for years. Every time I went in, I would start having fantasies about putting on my old leather jacket and riding it down to Mexico. Even if I had someone to help me get the new one off of the sidestand, I have no desire to ride it anywhere. Does it come with a garbage disposal? Sorry Sam, but I don’t ride a work of art! And there-in lies the problem. FYI – Claimed curb weight (full tank of fuel): Honda Gold Wing = 904 to 933 Lbs. depending on options. Indian Roadmaster = 930 Lbs. Harley Electra Glide Ultra Classic = 879 Lbs. “in running order”, which sounds like empty gas tank. Personally, I think the new Indians are across the spectrum well done and very beautiful motorcycles. This one could attract customers from both metric and American touring rig buyers. The one thing I’ve not done, is actually to visit an Indian dealership, but it’s on my list of things to do. I Utah, the SLC HD Dealer bought the Indian Dealership and opened it right next door. That says a lot about the future of this brand. I was there 6 weeks ago for the Demo Days and rode all three Indian models multiple times. Its an impressive and beautifully built bike. The fit and finish is equal or above anything from the motor company. The Thunder Stroke 111 motor is impressive (for a heavy cruiser). Its smooth and powerful. Now that’s a smart dealer ! Obviously both brands are going to be compared so why not sell both? You’re negative comments on poster’s comments is about the most predictable thing here. Your negative comments about his negative comments on poster’s comments is about the most predictable thing…after his…and the others. Thank you for likely best laugh of the day! Wish we could outlaw the term “Fugly”. 120 lbs heavier than an Ultra? Pass. Indian has nearly twice the HP as the Ultraless……other criteria counts, unless one owns a HD. At 630 kilo in weight , no way on earth i’m going to buy one.I thought they may have bought out a smaller engine capacity and joined in on the mid size cruiser battle , but it doesn’t look like it. My all round toring bike weighs 182kgs. That is a huge machine probably got its own postcode…. The GVWR (total weight of bike, rider, passenger luggage etc.) is 1385 lbs / 630 kgs, that’s not the weight of the bike. Bike only weighs 421 kilos (full of fuel). 630 kilos is GVWR. ONLY 928 pounds!? For less money you can have a BMW 1600KTL that weighs 150 lbs less, looks good, goes good, handles good and has 4 more cylinders. I guess I just don’t get the big fat cruiser thing. You and me both. But clearly, we are in the minority in the US. Me makes 3. Nothing compares to a six, flat or inline. My 2nd choice would be the Honda inline 6. None of these heavyweight twins offer me much love, rare exception being the Guzzi. Sorry, meant Honda flat 6. Opulent decadence draped over a behemoth of a motorcycle. “Stand back Eve, I don’t know how big this thing’s going to get!”, “Gosh Adam, it’s a Roadmaster!” I’m sure it’ll appeal to quite a few but it’s just too much for me. The more miles I put on riding makes me want less, smaller and uncomplicated machines. I guess it’s the whole, “Hey, look at me, can you see me now” mentality. This is classic garage candy, to be looked at and occasionally run to the bar. How much is enough? I’ll keep dreaming, but some day there will be a mass produced American made bike that isn’t a cruiser. The Motus is cool, but way too expensive. I’d love to put an American bike in my garage. An EBR doesn’t count? Not cheap, but not terribly expensive in this day and age. I hadn’t counted it because I haven’t seen one, and I’m not sure if they are for sale yet. But yeah, they should be fantastic. That is one very beautiful car. Yeah, I don’t think there’s much to say beyond that. People that purchased a Pontiac Aztec will be first in line to buy this machine. It’s official! There are many motorcycles now that are more expensive than some (decent and desirable) cars. Indian (Polaris) makes really beautiful bikes, but I would never buy one. Too big, too heavy, a little too ‘retro’, and a-waaaaaaaaaaaaaaay too expensive. Wish em luck though. It’s official! There is at least one motorcycle now that weighs more than some (decent and desirable) cars. Got Buick chrome too. What’s it weigh? Does a weight machine come with it? Looks to be a very nice bike, and while all these claims by Indian of “class leading/new benchmark/sets the standard” for the luxury-touring market may be true in terms of the American niche, come on, let’s not get crazy here, Indian. I’m fairly certain the BMW GTL 1600 inline six-cylinder isn’t exactly going to lose sleep over this one. The skirted fender is an Iconic piece of American Motorcycle History. It will never go away now that Indian Motorcycle of Spirit Lake has the resources to continue Americas First Motorcycle! Long Live Indian…. Polaris is heck bent on ugly. I don’t get it. WHen they came out with the first VIctorys, they were sharp. THey needed a little evolving, but I bought one and I thought is looked cool. Then they threw it away and came out with the Nessies. And bombed. I used to suggest that Polaris should design a Sportbike. After seeing where their head is at, I hope they never do! Looks like a Valkyrie tourer in the two tone version,just uglier. Really liking the Roadmaster. I think I’ll be giving another look. That is a gorgeous motorcycle. The black with brown leather just tugs at me. At long last, there is an American made, v-twin competitor for the Harley Ultra series. This is going to be interesting. I look forward to the inevitable road test comparisons. I like what Polaris has done with this brand. I’ve only had the pleasure of sitting on a few new Indians, I would not mind taking one for a test ride. The fit and feel on these bikes is really good. And while I don’t think of myself as quite rolling couch ready yet. I like these bikes. My one suggestion would be that Indian offer a aftermarket more normal looking front fender. I know that the fender is a design feature left over from the 1930s. And that is exactly my point. Some of us just want to move on. Without that flaired front fender this wouldn’t be an Indian dresser. What a beautiful bike! Some like it. I would prefer that option to move on. They really are great bikes. Gee. it’s almost just like a Harley Ultra Classic Limited! Almost. Only not so good looking. In fact, it looks more like a Victory. And that’s not so good.